Size: Standard League. Cover: White Vinyl with Red Stitching. Welcome! 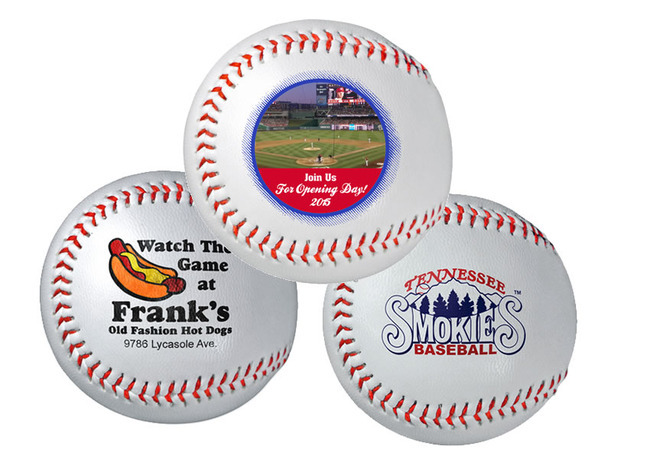 We are here to serve you and to help you put together your baseball event with custom imprinted baseballs, Mini-vinyl baseballs, customized baseballs and printed leather baseballs with your logo, business name and or advertising message, team and school name; wedding celebrations, birthdays, anniversaries, party time and spring openings with the best promotional baseballs money can buy. Click on links below to see product information. Display Case: See price below. SPEC SAMPLES: See price below. Baseball Bats & Baseball Beach Balls. Full Color Direct Imprint available on #BASE and #BASEC only. Imprint size: 1-3/8" in diameter. 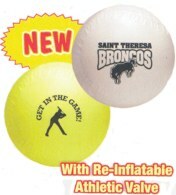 FULL COLOR Direct (logo/text/or photo), Add $0.60 upcharge per football/location. FULL COLOR transfer set-up charge: $50.00 per design. Additional location full color transfer imprint: Add $0.60 per location. All colors will be created out of 4-color process. Price Includes One of our Standard Color Imprint, one location. (See below for additional color imprint), and for Full Color Direct imprint. NOTE: All prices, quantities, sizes, brand name, picture and/ or colors are subject to change without notice. NOTE: The products shown here are representative random samples only. In your order, please indicate the item name and its # that you desire, and we will imprint it for you along with your logo/ and or text you provide to us. To place your Custom Printed Baseballs order. To Email your artwork, see below. Black, White, Silver, Orange 1665, Brown 469, Gold, Yellow 107, Dark Green 343, Green 347, Teal 320, Baby Blue 292, Navy Blue 281, Royal Blue 2728, Purple Violet C, Pink 211, Burgundy 209, Red 186. Pantone Color Match (PMS): Add $40.00 per color. Photos: Not suitable to imprint on baseballs. 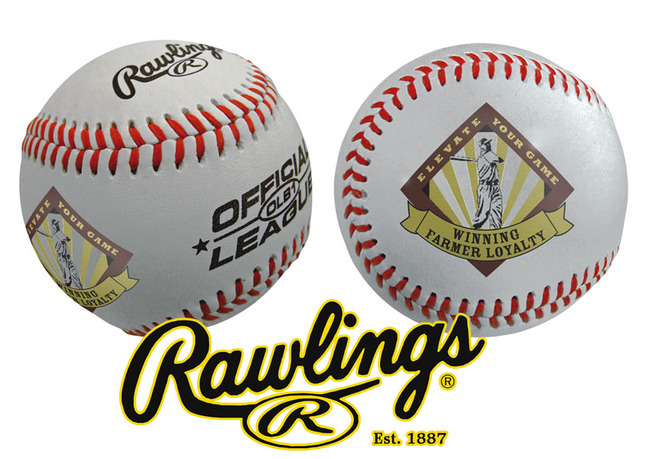 SPEC SAMPLES: $50.00 set up charge per color, plus the retail price for 5 baseballs with one color, one side imprint. Each additional color or side add $50.00. CUSTOM ARTWORK/LOGO/: Please provide Computer Generated Artwork in Vector Format 300+ dpi and email it to us in (.eps, .ai, .pdf) files. To email your artwork to us, PRESS HERE. If you need artwork preparation, or requirements, for details go to the following link: Artwork pricing, requirements, preparation, and e-mailing artwork to us, PRESS HERE. Set-up (screen/ plate Charge): Add $30.00 per color - per design for item #BASE 350. To prepare, mail, and/ or to e-mail artwork to us, PRESS HERE. PROOFS: If requested, add $12.00 for email/fax proof of your logo, text, or both. Any author's alterations made after the proof has been sent to you, PRESS HERE for artwork modification/ preparation. NOTE: If the artwork you submit to us needs to be redrawn, fixed, or typesetting, please PRESS HERE for artwork charges. Unimprinted #BASE 350 and/or BASEC: $2.08 each. Minimum order 60 pieces/Item #. Shipping charges will be additional. Display Case: Available at $2.05 each. Random sample: $9.00 each. Shipping charges will be additional. • Here's a great opportunity to identify with the winner in your community with these customized baseballs. 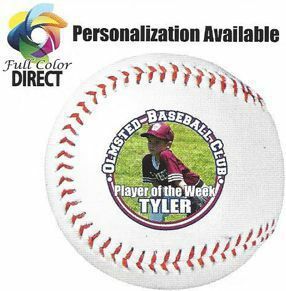 • Bright, bold imprinted messages help promote team spirit for schools and booster groups with these custom imprinted baseballs. • Synthetic leather cover and red stitching for promotional baseball #BASE 350! • Bright ink colors work great on these promotional & customized baseballs. Add screen charge (see above), plus $0.30 per color, per imprint. Full Color Direct Imprint Charge: $50.00 per design. Second Side Full Color Direct Imprint: Add $50.00 per design (if different design), plus $0.50 per piece. Add $40.00 per color. Exact color match can not be guaranteed. Individually polybagged, approximate 18 LBS./50 pieces. (161607/18#, 12-13-14). FOB factory or warehouse. We will use our discretion as to the best method to be used. Please call us for approximate freight charges when ordering. From receipt of complete order and approved artwork, please allow approximate 10 - 12 working days production time, in the plant, for customized items, unless otherwise noted. We reserve the right to ship and bill 5% over or under the ordered amount on imprinted baseballs. Order your custom printed baseballs NOW and save time and money! Then follow the instructions in the ordering form in each page, or call us at the telephone number shown at the end of each page to place your order. Remember. Customer satisfaction and high quality service to our customers is our main goal. For your convenience, we accept Visa, Master Card, and American Express credit cards. This is the page (Click here) to order from 10,000's very exciting & unique every day needed top-quality Promotional Products & Custom Printed Stationery ready to be printed and customized with your logo/business name/advertising message, school name, picnic event, birthday party, wedding announcements, anniversaries, sport events and many other great ideas you can think of. Many of these items are under $1.00 such as wallet calendar cards, laminated business cards, printed Magnets such as: football, baseball & basketball schedules, sports magnets, car magnets, all the U.S.A. states magnets; postcards, mailers, I.D. cards, door hangers, hand fans, stickers, decals, calendars, notepads, scratch pads, stik-on®s, brochures, banners, cookbooks & coloring books. Products for every occasion and promotional event such as to say 'Hi', or 'Thank You' to your customers & prospects, or friends, or family members; or to say 'I Love You'. Many of these products are Made in USA.